Kyajo Ri as a challenging 6000 meter has been famous trekking peaks of Nepal as it gets ample climbers. Moreover, eighty percentage of climbers are reported to be learners and seventy percent of them have succeeded in this daring venture. Mount Kyajo Ri stands 6187 meters tall in the distinguished Mahalagur Himalaya Range of Nepal. Nepal Mountaineering Association of Nepal (NMA) has listed Kyajo Ri in Group A Mountains which means it requires solid strategy to climb other than in category “B” mountains. 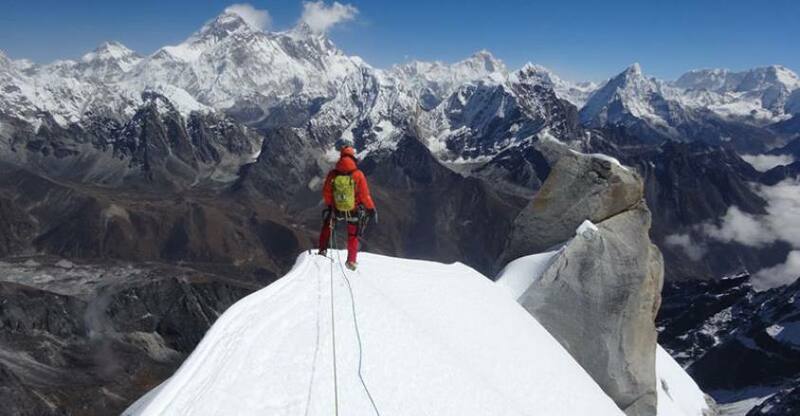 In 2002, Mountaineers Mr. Duncan Wilson and Mr. Vincent Marche earned fame in mountaineering community as they were the first to reach the Pinnacle of Kyajo Ri. Finally, people with or without the background are welcomed to try their luck in this mountain. This peak could be ascended from various routes and one of the best parts of climbing this peak is the breath-taking views of the entire Khumbu. This peak is known for its sharp summit and the route of this peak finishes on the pointed summit which is the highest and not like other peaks like; Island peak or Lobuche peak. 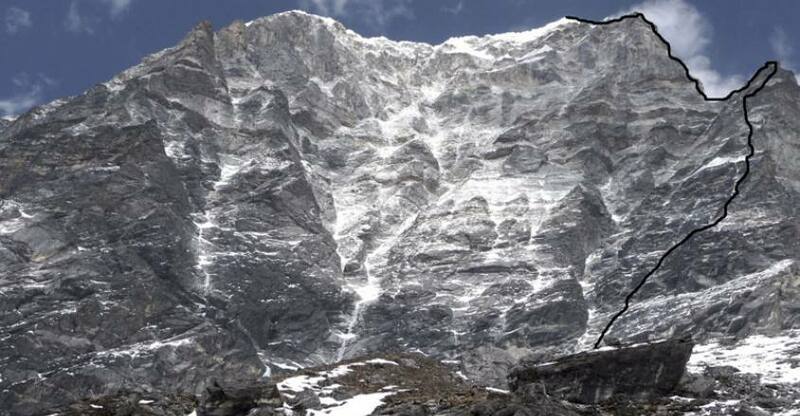 Kyajo Ri is located in the midst of Khumbu and one of the aspects of this peak is that the route which faces south would offer warmth as it is towards the sun. So you can have a great and enjoyable experience as you climb this peak. You could experience the incredible views of the Khumbu region as you climb this semi-technical peak and the shimmering lakes on your way will surely grab your attention. Camping basic climbing Kyazo Ri is not technically difficult peak but good physical condition and previous climbing experience is plus point for Kyazo Ri climbing. Day 02: Fly to Lukla & trek to Phakding (2,652m) 3/4hrs. Day 03: Trek to Namche Bazaar (3,440m) 5/6hrs. Day 05: Namche Bazaar to Mende (3736m)5/6 hrs. Day 06: Trek to Kyajo Ri Base Camp (4550m) 5/hrs. Day 10: Camp I to Camp II (5700m) 4/5hrs. Day 11: Summit Day and Back to Camp II: 7/8 hrs. Day 12: Trek back to Base Camp: 4/5 hrs. Day 13: A reserve day for the conditional situation. Day 14: Base Camp to Namche Bazaar: 5/6 hrs. Day 15: Trek to Phakding 3/5hrs. Day 16: Trek to Lukla 3/4hrs. While you landed at the Tribhuvan Intl. the airport welcomes you with your name and assists to transfer in your hotel in Kathmandu. After time to get refreshed, and briefing about the program and evening we’ll pick up you for welcome dinner in one of the typical Nepalese restaurants with the cultural program in the heart of Kathmandu and overnight at Hotel. early morning you’ll be transferred to domestic airport to fly to Lukla (2,800m) It takes 35 minutes scenic flight to Lukla airport (2,800m) you will have a tea break, while the guide sort out and divide the loaded baggage to be carried by porters. A guide will manage the lunch place depending upon the time of arrival at Lukla. The trek starts with the most scenic view of Numbur Himal & Phari. We further on to Phakding passing some Sherpa farm villages. We follow the trail to Dudhkoshi River with gradual with few ups from Thado Koshi, where you can have a lunch with a superb view of Kusum-Kangaru (6,369m. crossing a short suspension bridge, from here after a short climb brings us to the Ghat village, another ½ hrs of gradual walk brings you to Phakding village. Overnight at guesthouse. The trek start in the morning and after crossing the suspension bridge over the Dudh-Kosi the walk is pleasant with few short uphill and downhill and re-crossing the same river again with the magnificent view of Mt. Thamserku (6,608m) from the Benkar village. continuing crossing the bridges and reaches Monjo where is entrance gate of the Sagarmatha National Park, where your trekking permit checked and keeps the record of all trekkers. When enter the National park boundary we descend and a gradual walk brings us to the suspension bridge over the Bhote-Koshi river, after the bridge Jorsalle village is reached, the last village till Namche Bazaar, from here the walk is pleasant on the river bed till the last bridge over the Imjatse river is reached, from here the walk is along the winding uphill path all the way to Namche Bazaar, with magnificent view of Kwangde peak and it other sister peaks towards east with Kusum kangaru on the back as you climb higher, view of Mt. Everest, Lhotse and the closer view of Tawache peak can be seen from some part on the way to Namche. Finally, we reach colorful houses called Namche Bazaar main gate of Khumbu region. Overnight night at the guesthouse. You may have full day leisure today for the acclimatization or stroll around the market if Saturday can be seen many people in Saturday market for shopping to fulfill their daily needs and only one shopping market in the surrounding areas. Also, you can visit Sherpa Museum as well a great place to learn Sherpa culture and history of mountaineering or visit up to the luxury Everest view hotel & Syangboche airstrip and stroll back to the hotel for overnight. The walk to Thame from Namche is relatively easy. The trail follows an almost steady level until we reach the settlement of Thame, a beautiful village with amazing views of the Himalayas. From here the trail makes a short ascent to Mende. Overnight at guesthouse. From Mende, we leave the main trails and follow a faint yak trail up over a couple of passes to enter the Kyajo Drangka; the isolated broad valley south of Kyajo Ri. On our way, we enjoy great views of the Himalayas including Thamserku, Khumbila, Kusum Kangaru, Kwangde, and Pachharmo. Kyajo Ri Base Camp is set up on a flat surface between the rocky mountain on one side and a small river on the other. Overnight at Tent camp. This day is set aside for proper acclimatization before summiting the Kyajo Ri peak. However, since it is always wise to stay a little busy during acclimatization, we will be hiking to Camp I and back. Furthermore, we also check our climbing equipment. Overnight at tent camp. The ascent to Camp I begins with hiking over a grassy spur and boulders. Next, our trail follows the upward rocky section with a lot of boulders and skid pebbles. We walk for another few hours on a steep trail before reaching Camp I. Our camp will be set on a level ground, with good views and within easy reach of water flowing out from the frozen lake at the foot of the Glacier. Overnight at tent camp. Today involves some technical climbing over mixed face slopes up to 55 degrees along with negotiating through a glacier. Camp II lies near the glacier and has sufficient place for camping. From the camp, we can see the climbing route we will be attempting the next day. We pitch our camp near a big glacier lake. If the weather is favorable, we get plenty of sunlight during the day. Overnight at tent camp. Our summit day begins in the early morning, at about 3:00 am. After light breakfast, we start to climb through the rocky part with big boulders. Next, we reach a part of the glacier from where it is a fairly hard climb. Here the ground steepens, and we climb snow and ice on the Southwest Ridge. There is one short rock section but primarily the climbing is on snow and ice. The sharp summit is a narrow wedge of snow. After spending some time celebrating our success and taking pictures on the summit, we return back to Camp I. Overnight at tent camp. Today we return back to Kyajo Ri Base Camp and celebrate the successful completion of our trip. The return trip will be relatively easier than the summit day as you will have already known what to expect on your journey back. Upon reaching the Base Camp, we relax for some time and if interested, we may even explore the surrounding area. Overnight at tent camp. We are a team deeply committed to maintaining ecosystems at home and around the world. Therefore, before leaving the base camp, we clean the area. The mountains are our home and we believe that it is unwise to disregard its value by not preserving it. After cleaning the base camp we return back to Namche Bazaar. Overnight at guesthouse. This morning we trek back to Lukla, you can walk at your own pace and enjoying the lush green scenery around and passing through the incredible mountain scenery and local Sherpa village. Arrival in Lukla and you’ll have time to stroll around the areas and guide will re-confirm your flight ticket and enjoy the last celebrate dinner with your crew member and overnight at hotel. The flight time to Kathmandu, are scheduled for morning normally, because of the wind in the afternoon, sometimes the flight time can be delayed due to bad weather and other reason beyond our command. Anyway, we will fly back to Kathmandu and your guide will transfer to the hotel. You may have time to relax after the long journey and take back your breath and rest at your hotel. today is free or last minute shopping for souvenirs or gift to your family, friends or relatives for you until your departure flight/ drive to International Airport for your departure flight to your onwards destination.